When you see the name "Neville" you think of the Neville Brothers, Art, Cyril, Charles, and Aaron, and perhaps you think of New Orleans and Creole music. And just maybe you might remember Aaron Neville's hit single "Tell It Like It Is," which reached #2 on the Top 10 Pop list and topped Billboard's R&B charts for five weeks in 1967. And Aaron Neville has been active in music and film ever since. Yet chances are you don't know his early records on the Minit and Parlo labels, which for me is his best work. I consider it very precious music. Let's see if you like it too. Almost all of it can be found on his album "Tell It Like It Is," which came out in 1966. I don't see it on Amazon.com, but the tunes are on YouTube.com and elsewhere, so you can still hear them. And you can get that album used on Ebay. First, let's hear his big hit "Tell It Like It Is." This next tune is incredible. Listen to the words very carefully and think out of the box. This is as close to a definition of the illusory nature of reality and the clarity of Mahamudra as I have ever heard in song. Can you hear it? "She Took You for a Ride"
Here is another complete show-stopper, sung so gently, yet communicating so much. "You Think You're So Smart"
And so it goes. Let your mind relax and listen to what Neville put out so many years ago, as fresh today as it was then. There are not many artists of this caliber. 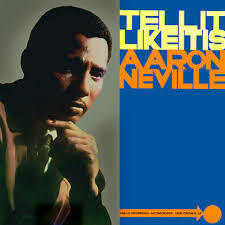 Well there you have the early Aaron Neville, for me always a special treat to listen to, even after almost fifty years.